We seem to live in an age which adores attributing areas of specialization to statements of compliments or admiration. No longer is it sufficient to talk about an artist’s overall excellence; no, it sounds better when a sentence such as “especially in his rendering of part-writing in post-Gesualdo works” can be utilized. It sounds good, it has been researched, and it is extremely difficult to argue with. This kind of Look-Ma-No-Hands criticism always was part of the vocabulary pertaining to paintings. By now it has taken hold of music essays and detailed descriptions of an artist’s performance. No longer is it a glowing compliment to speak of overall accomplishments, when the specialization virus can be added, such as “most obvious is his familiarity with the style of the early Pfitzner Sonatas”. The reader has to scurry to encyclopedias and dictionaries to keep ahead of the criticism. Of course, all this is manna from heaven when it comes to the dissection of a great many performing artists and their limitations. But there are a few others, the blessed few for whom complimentary details are unnecessary. Zimerman, Heifetz, Karajan, de Larrocha and others float by, unperturbed by fancy vocabulary, serene in their mastery and secure with their virtuosity. 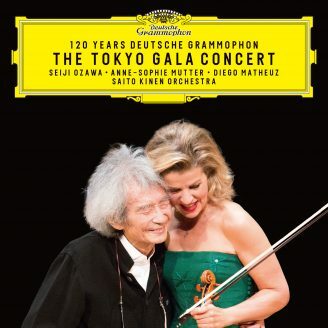 The violinist Anne-Sophie Mutter is that sort of supreme artist. She is much given to recording “The Complete Mozart Sonatas and Concertos”, “The Complete Beethoven Sonatas”, Bach Concertos, but these are not specializations, not when you also have to add Bernstein, Korngold, Berg, Gubaidulina, Previn and Rihm, scores which might sound, in lesser hands, knotty and forbidding, but which shine out in beauty when coaxed by her bow. The ferocity of the beginning of the Bartók Concerto, with its commanding virtuosity, then can be followed by the intensely private and yearning First Brahms Sonata. Anne-Sophie is also utterly at home with Sibelius, and with Mendelssohn, and Tchaikovsky, and with the elegant charm of Kreisler or Gershwin. She has an almost limitless repertory of sound, and I can only marvel at her choices of phrasings and bowings. I have never heard her put a musical foot wrong, she is the ideal interpreter, the ideal violinist. I would be remiss if I did not also comment on her stage deportment. Not for her the hair-tossing, foot-stomping, grimacing display of effort. She stands immobile, some times slightly frowning or smiling, totally concentrated – The Complete Musician. I know of no performer I admire more.